This is an absolute first class Rio Casino heifer with the total package of horn, body, color and disposition. Outstanding horn measurement with 33.5 inches tip to tip at 12 months, 47.75" (placed 3rd at the Horn Showcase) at 18 months and 59" at 25 months!! 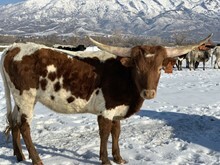 She is exposed to Atlas, a big framed and colorful Drag Iron son with big horn bases for a 2015 calf.